Capacities from 150 to 440 pounds. Floor Protective Tread - Affords superior floor protection. Wear - Extended tread life in wet applications. 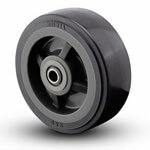 Chemical Resistance - Allows wheels to be used around many chemicals and solvents. Crowned Tread - Improves rollability. Tread - Is washable and affords quiet operation. Temperature Range - -40ƒF to +230ƒF.